This beautiful vase isn't made with actual Fall leaves. Pam created these DIY transparent Fall leaves with decoupage and food coloring. Such a fun project for lanterns, vases, and any Fall project for people that don't have beautifully colored Fall leaves lying around in their yard? 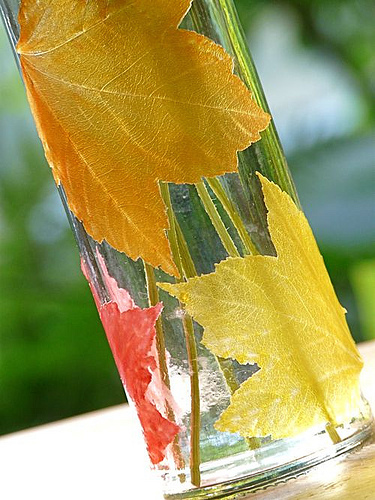 You can check out how to make transparent Fall leaves for crafts over at Gingerbread Snowflakes. So cool, this would look awesome in our windows! I'm going to give it a shot this weekend!